In a surprise move, Microsoft on Wednesday released an official iOS client for its Xbox Live online service dubbed My Xbox LIVE. The app comes on the heels of the redesigned Xbox Dashboard interface that Microsoft began rolling out earlier in the week. The app allows Xbox users to log into their accounts, see which friends are online, send messages, browse their games, read news from Microsoft, and even edit their avatars. In addition, the app works with some of the new features of Xbox Live, including letting you create Beacons—announcements to your friends that you want to play a particular game. For Xbox gamers who are also iOS users—such as yours truly—this day has been a long time coming: Previously, we’ve had to rely on using Xbox Live’s clunky Silverlight-laden Web interface, or turn to lackluster third-party apps, all of which were limited by not having full access to Xbox Live. That said, there’s still room for improvement in Microsoft’s own offering. For example, the app doesn’t support push notifications, which would be handy when your friends send you a message or set a Beacon. In many places, you have to manually tap a refresh button to check for new information. And the interface is a strange amalgam of conventions from iOS and Microsoft’s own Windows Phone operating system. Still, it’s a sight better than what we used to have to deal with, and, frankly, I wasn’t sure that Microsoft would ever choose to port a feature this prominent from Windows Phone to iOS—so good on you, Redmond. 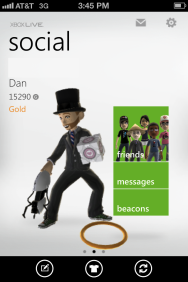 My Xbox Live is a free universal app for iOS devices running iOS 4.3 or later.